Greengrocer, baker, and health food shop on the Kentish Town/Holloway border. 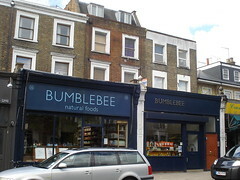 Originally established in 1980, Bumblebee now occupies three shops on Brecknock Road. On the east side is the bakery photo, with a range of fresh bread as well as cereals, grains, dry beans and lentils, and teas. Many of the beans and lentils are available unpackaged photo, allowing you to bring your own container and buy as much or as little as you want. Soft drinks, takeaway salads, and a couple of takeaway hot dishes are also available from this shop. On the west side, a fruit and veg shop sits next door to a general grocery store (both pictured). The fruit and veg shop also has a cheese counter and a selection of unpackaged herbs and spices photo, again allowing you to buy the exact amount you want in your own container. The general grocery store has unpackaged nuts photo plus toiletries and storecupboard groceries including jam, honey, vegetarian pate, pasta sauces, oils, and Japanese products. Accessibility: A large step into the bakery. Smaller steps into the other two shops. There are three or four more steps inside the fruit and veg shop, leading to the cheese/dairy area. Last visited by Kake, August 2014. Last edited 2014-09-07 19:35:49 (version 2; diff). List all versions. Page last edited 2014-09-07 19:35:49 (version 2).